Tripwire Art Director and co-owner David Hensley has three PC setups for work and for play. His desk at Tripwire's Atlanta offices—where the team is at work on Killing Floor 2 —includes three monitors, ambient lighting, and framed ghoulish artwork, fitting inspiration for the zeds he and his team bring to life. 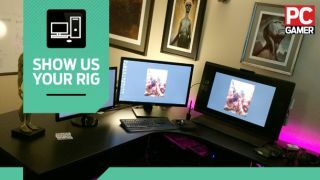 His home setups are even more diverse: a Wacom tablet on an easel, a dedicated audio workstation, and multiple streaming setups let him play games in the living room, bedroom, or even the bathroom. PC gaming on the toilet. The future is now. My home PC is custom built, all though I had someone assemble it for me. I used to build computers a lot when I was younger, but now I just want the things to work, and not get bloody knuckles putting it all together. I make music as a hobby so I have a setup up just for that, as I found it difficult to go back between an Art/Gaming set up and a music set up, due to all the hardware required to make music. I make weird horror movie sampled or inspired music, you can hear some at my SoundCloud page . Probably the Wacom Cintiq mounted on a wooden artist easel. I didn't have enough room on my desk for 2 monitors and a Cintiq so it was the perfect option. I can game like crazy, or do 3D modeling, and when I want to paint or sculpt I can just enable the Cintiq and go right to painting without changing any wires. Another strange thing is I have a habit of streaming steam games in the bathroom using a Samsung series 7 tablet and a prototype Steam Controller. I also have a living room Alienware X51 and a Steambox in my bedroom for Big Picture gaming. At work I usually keep a Freedom Of Teach anatomy statue on my desk if I'm doing any kind of character concept art or sculpting. At home I try to keep my desk pretty clean. I like to surround my desk with artwork that I enjoy as you can see at my work set up. On my my music station you can see a strange looking 3D printed blue thing. That's a 360 hero's spherical Go Pro mount for shooting 360 video for VR. You can mount 7 Go Pros in that thing. I play all types of games on a lot of systems. Currently I'm playing with random Oculus Rift experiments. I've been addicted to FTL on the iPad. In the living room and Steam Big Picture I've been playing South Park: The Stick of Truth. On my PC gaming set up I've been dabbling in Rust, playing Outlast, and Dota 2. That's a hard one, I love so many games. I think Dota 2 is my current favorite game, but it either makes me really happy or fills me with rage every time I play it, haha. There is almost an infinite amount of depth to the game, but you can also play in your comfort zone. It covers when you want to play something you know and are comfortable with, or learn a new character and experience a new learning curve.